December 2014 in Musical Gear and Equipment!!! With a Shure sm86 condenser mic and a low end dynamic mic. When I select the input for the channel, Mic1. For the software to read good levels I'll have to turn the pre-amp almost 3/4 of the way. Now, if I run Guitar Rig 5 I have to turn the pre-amp gain all the way down and turn on pad to the channel because the mic becomes very hot/responsive. There may be a place in the different programs where you can set the parameters for the input levels. Often your choice will be a nominal input level for the program to be at either -10dBm or +4dBm. That's a 14dB difference in levels, which is quite significant. So if your program is looking for a +4dBm signal, then it wants a really hot input, and will sound weak with a minus 10dBm signal. Conversely, if the program (or hardware) wants a -10dBm signal, and you put a +4dBm signal into it, it will be way too hot and probably will distort. So you need to look in your manuals for information about input gain levels, for both the programs AND the focusrite unit. The job of the preamp is to make the relatively weak mic signal into a line-level, low-noise signal for processing in your program. It looks like your focusrite unit doesn't really have an analog output. It has monitor outs, but those are just for listening. I suppose you come out with either the spdif output or the usb, but if it's already been digitized, then it's no longer the -10 or +4, as those are analog levels. The usb MAY be analog, I'm not that familiar with recording through usb. Generally, you want to record at the hottest levels that you can, but while still avoiding any distortion whatsoever. If you have red LED peak indicators on your inputs, you generally want them to flash faintly only on occasion, as the peak indicators normally activate about 4dB before any actual distortion happens. A hot record level helps to keep the most favorable signal-to-noise ratio going, and that is the goal. Max amplitude with zero distortion. The "guitar rig" setup probably expects a -10dB signal level. I agree with what Bob said. It sounds like Audition and Ableton are expecting a different level for input. So, the solution as I see it would be to look at the audio configuration of the in both software packages and make them match as closely as possible. 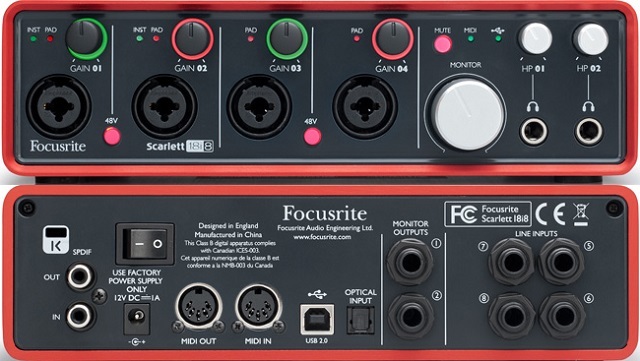 Ideally, you want to send a line level (-10 dB) signal from the Focusrite into your software. Hope this helps.